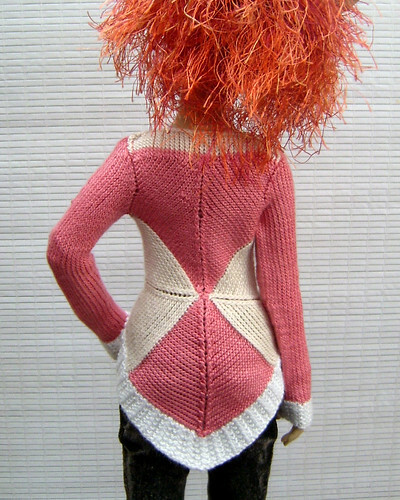 I started this in December, not long after I saw the still from Catching Fire that made all the knitters on the internet want to knit That Sweater. Every single stitch in everything but the white ribbing is twsited, both knit and purl, including decreases both left and right leaning. For the knitters that will mean something; everyone else: suffice to say that it slowed me down a bit. I'm so happy with it that if I had other colors of this bamboo thread I'd be seriously tempted to start another one. Well, not really, but I sure did increase my output there for a bit at the end of May. 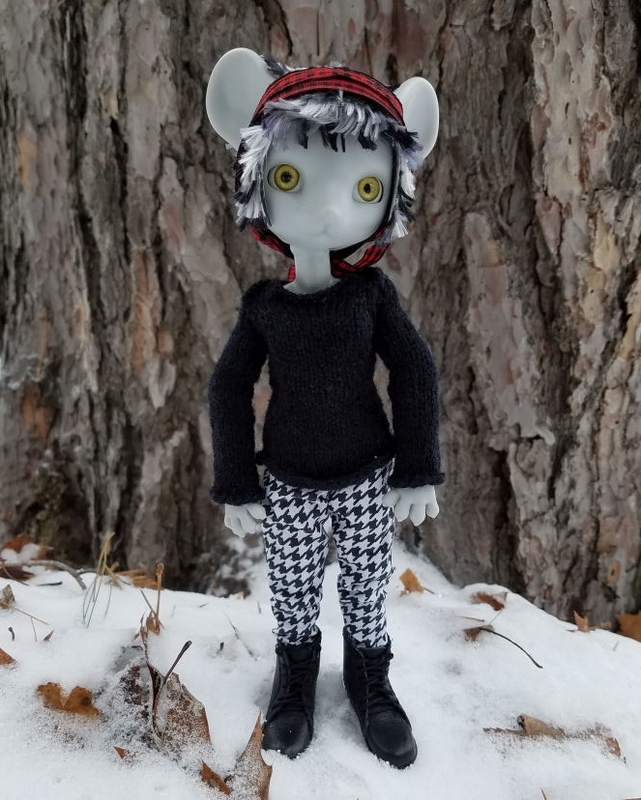 There was a doll meet/party at Mint on Card, a doll store in Traverse City, and I wanted my girls to look their best so I went a bit nuts for a week or so beforehand. One last thing finished before the party and not photographed, a new case for my camera because the original one is all icky nasty with age. I knit one of out cotton in linen stitch with a velcro closure on the flap. The aspens/poplars have leaves the size of quarters, the delphiniums are about eight inches tall, the grass is green, and it is snowing. So, as I sit facing a window that shows me this all too clearly, I will do a knitting update and silently think a stream of profanity to make a sailor blush. 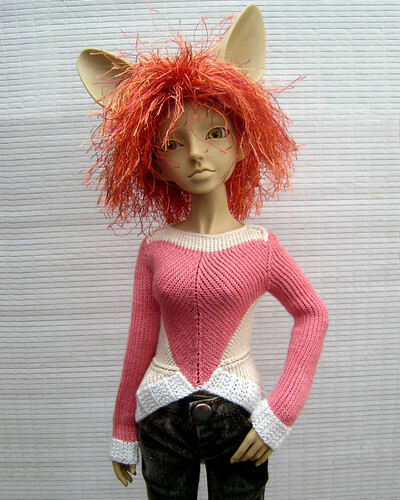 For those that remember my ranting about my craft blog, Omnifariously Knotty, well it's still lacking OpenID... but there are posts! Not many, but there's actual content. To be specific I put up a post on what I did to make Namid's white top (seen in the lace stole photos) from a baby top/dress pattern as well as a post on how to modify my shorts pattern into capris. The paper clips I have are the vinyl coated ones that are just a bit over an inch long. 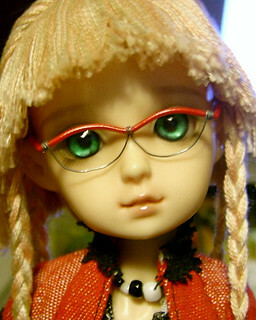 They straighten out to about three and a half inches long, which is just long enough to do this style of glasses for Anjeni, who has a 14cm head. 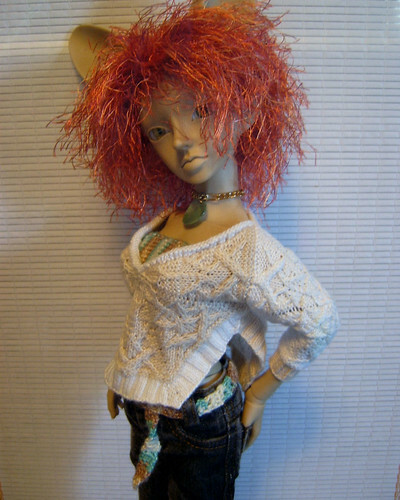 For larger dolls you will need a larger clip or a longer piece of wire that is about 20ga in thickness. 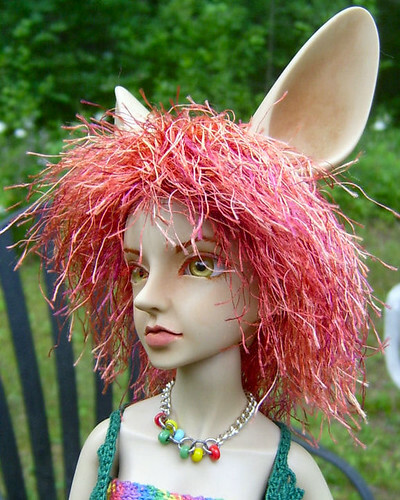 For an idea of how much wire you will need, measure your doll from the bridge of their nose to behind their ear in a straight line parallel to the side of their head. Double that and add the width of their head across their face, again in a straight line. Add a smidge for shaping the top of the frame, it is better to cut the wire too long than to try to get a too short piece to work. I straightened the paper clip using my fingers since it's really easy to crack the vinyl if you use pliers. Also be cautious using pliers on anodized clips or craft wire, you can wrap tape around the jaws of the pliers to help cushion them if your fingers aren't strong enough to straighten your clip/wire. I bent both ends of the straightened clip one inch from the end to make the bows. 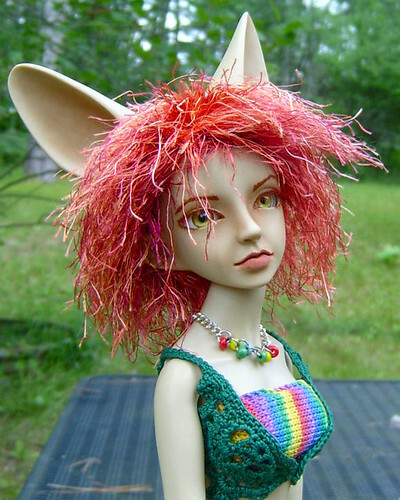 For larger or smaller dolls this measurement should be the bridge of the nose to the back of ear length, or whatever half the total wire length minus the face width happens to be. Then I bent the center of the wire at a right angle perpendicular to the bends I made for the bows to make the center of the bridge. The curves for the tops of the "lenses" I made by curving them over the barrel of a Sharpie marker and then flattening out the curve a bit. I used three inches of the 28ga wire to make the bottoms of the "lenses" by making a lark's head knot around the center of the bridge and then wrapping the ends at the corners of the bows. I used the barrel of a pen for a spacer in the lens area so the two lenses would be at least close to the same size. As part of my Christmas doings today, I redressed my dolls. 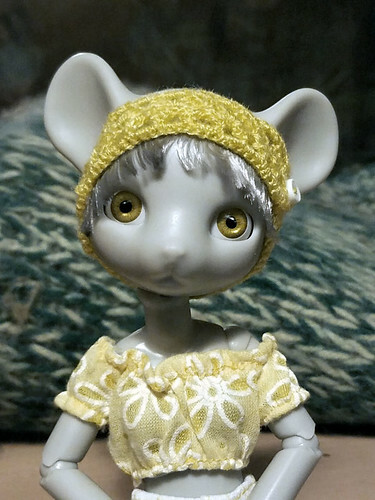 I was just going to redress Rico, into clothing she would not like much I admit, but while I had her down and headless I swapped her neck S-hook for Anjeni's (and tried Namid's on her, it's too large for her head). Then, since I had them all down and headless, they all got changed for the holiday. This is a public archive of the post I made at the Den of Devils. 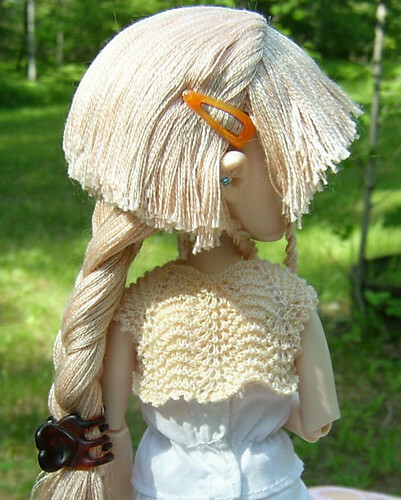 I finally managed to get a spot of Not Raining to get some photos of my doll knitting. 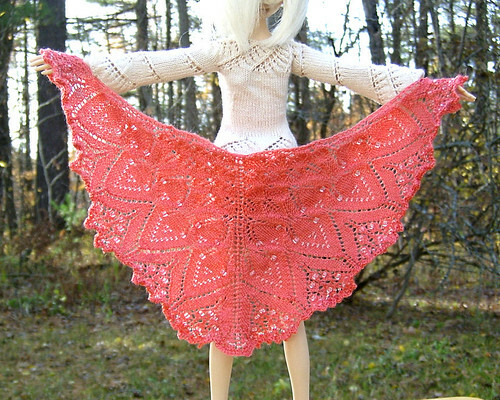 First up, that doll shawl that has been done and blocked for months. It's been waiting so long for a photo it almost needs to be blocked again. I really should make a point of posting something on a regular basis outside of the month of November. Looking back, my last post was in mid-July. Well since then I went and visited family for most of the month of August. There isn't much to say about that other than I figured out that setting up a wireless router with Verizon's DSL is not as straight forward as you would think. But I did it, and after that point I had a nice connection to use the laptop with and did not have to borrow my brother's PC to get online. Mom waffled on getting herself a laptop again. I told her my first day there that if she wanted one we should pick it out early in my visit. So of course she decides to seriously consider it the day before I planned to leave. Ultimately she opted not to, but I half expect a phone call where she says she bought one and needs help setting up everything (and I do mean everything, the closest she's come to having a computer is an electronic typewriter). In more ways that one. I finished the sewing thread bolero for Anjeni. 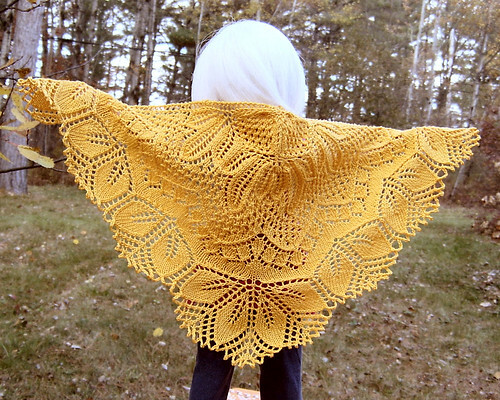 The pattern is once again Ysolda Teague's Cloud Bolero. I knit the smallest size on 5/0 (1mm) needles with two strands of sewing thread. Yes, it's that time again, catching up on the knitting projects. And this last one isn't cut because I am damned proud of it. The observant with good memories will note that's the same pattern as the neck of my red shawl. I made some alterations to the second section (the mesh, diamonds, and chevrons) and then pretty much did the edging that I plan to finish my red shawl with. Other than those projects all I did was start the ribbing on the over knee socks. I do seem to let these things pile up. And finally, the writing. I have fourteen character bios written, I just have to decide who the fifteenth character will be and I can get to answering the questions. I'd like more questions, really. Maybe I should post the bios, in an order that is NOT the order of the characters in regard to the numbering for the questions? I don't want to bias questions by having people ask them thinking the fifth bio belongs to character number five, since it won't. 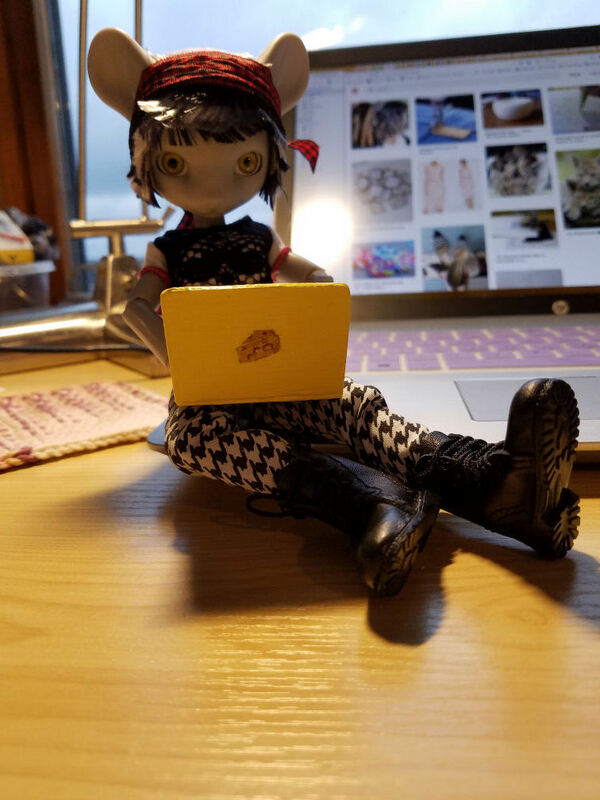 I'm not in the habit of posting photostories with my dolls, but I did do a story style box opening for Namid and I thought it might be a good idea to have a back-up copy somewhere. So take a trip back to December when Namid arrived in time for Christmas. While we were without internet for all of Friday and half of Saturday I managed to finish up a few knitting projects and write (and get sucked into reading my own writing, again). I'm still writing biographies for the characters I will be using to answer the questions asked in my last post. Hopefully I'll get a few more questions to work on by the time I'm done with the biographies. Since I have just four out of fifteen done it might take all week unless I hit on a really good writing streak, or learn brevity.